Average Weight	: 55 - 85 lbs. The breed is several centuries old, is derived from the same selective stock as other German hunting breeds and is a descendant of the Bloodhound. Wanting to develop more of a multi-purpose hunting dog, the Grand Duke Karl August of Weimer was responsible for the earlier stages of the Weimaraner's development. In 1880, the breed was shown at a dog show located in Berlin where the dog was referred to as a "l'mongrels." The Germans were famous for having a reputation as not only having but developing the best hunting dogs in the world, and the Weimaraner pointer or hunting dog was a result of that development. The Weimaraner had originally been bred as a hound like fur-hunting, tracking dog that was supposedly meant to be aggressive toward the predators it was meant to hunt, and as the dog became more and more domesticated, the functions of bird-hunting and retrieving was bred into the dog for the needs of the German hunter and the Nobles of Weimar, and eventually became highly prized for their versatile hunting skills. Eventually the breed became widely known as the "Gray Ghost" as it was gray in color, with the ability to be extremely quick, using cat-like stealth when out in the field, combined with a ghost-like, silent, shadow-way of working the prey. Over time, the nobles rigidly began to control the Weimaraner's availability to the public. This was to ensure the quality of the breed, and the German Weimaraner Club was formed at this time for that strict purpose by amateur sportsmen--with the purpose of breeding the dog for sport, not for profit. From then on, very few non-club members knew about this highly protected German dog breed--the club membership was tightly restricted and only club members could own and breed the famous Weimaraner with the breed type and temperament becoming proudly refined, with legends upon legins springing forth about the "great gray hunting dog." As the breeding continued, the 1850s showed a conversion from the "bear and deer hunter" hunting dog to the that of "fur and feathers" with those newly developed hunting instincts remaining today. This restricted membership changed when in 1928, a Providence, RI, sportsman by the name of Howard Knight applied for membership in this restricted German hunting club which resulted in him coming back into the United States with two sterile females. But through perseverance, he finally achieved success when three female dogs and a puppy were sent to him: two were litter sisters--Adda and Dorle v. Schwarzen Kamp--and a one year female named Aura v. Gaiberg. The puppy was named Mars aus der Wulfsreide. When others began joining Howard Knight's efforts, the Weimaraner Club of America was formed in 1942 with a breed standard created, with AKC recognition in 1942, coming out in 1943 at Westminster. The Weimaraner is a good all-around hunting dog and an excellent pointer. It was originally used as a big-game hunter for bear, deer and wolves, but is used more today as a birddog and even a water retriever. A Weimaraner appeared in a Van Dyck painting from the early 1600s. Howard Knight, who founded the first American Weimaraner breed club, imported the dogs to the United States in 1929. The popular children's TV show Sesame Street has been known to plays skits with this breed dressed up in human clothes. Some of its talents include: hunting, tracking, retrieving, pointing, watchdog, guarding, police work, service for the disabled, search and rescue and agility. An elegant and noble hunting dog with the look of an aristocrat, combined with kind and gentle features, the Weimaraner is very athletic with a total balance of body form that gives it the highest star quality look. The tallest of the gun dog groups, a major requirement of this beautiful breed, in show trials, is that it works in the field--regardless of its background in show or hunting stock--with great speed and endurance. The Weimaraner is a breed that will normally exhibit alertness and friendliness, combined with energy and intelligence. Known to be bold and excessively rambunctious, this breed loves to hunt and run. If not allowed to do what their heart truly desires and is pent up, they will develop a destructive manner with sheer frustration. With a tendency to be headstrong and stubborn, lack of exercise or running will force these traits into a negative and unhappy dog. They need a yard that is large enough to run and explore in, and a home that allows them to sleep indoors on cool and cold nights, due to their very short hair. A special type of breed, the Weimaraner will be happiest when it is allowed to live a life both indoors and outdoors. The best owner for a Weimaraner hunting dog is one who enjoys the outdoors and lots of exercise, and seriously wants a four-legged companion instead of a penned-up dog let out only on the weekends. Daily high strenuous exercise is mandatory for the Weimaraner, so the city life is not for this breed unless it has that certain tye of owner. The Weimaraner needs to have an owner who has the strength and confidence to train, exercise, socialize, and love this dog. Timid with people and other pets, it makes an excellent watchdog. A thinking dog, this hunting dog is not only very proud but can be quite dominant, quickly discovering in his trainer or family member who is most like its personality. Intolerant of weakness, the Weimaraner treats such people with contempt and ignorance, preferring to shower the attention to those more deserving. 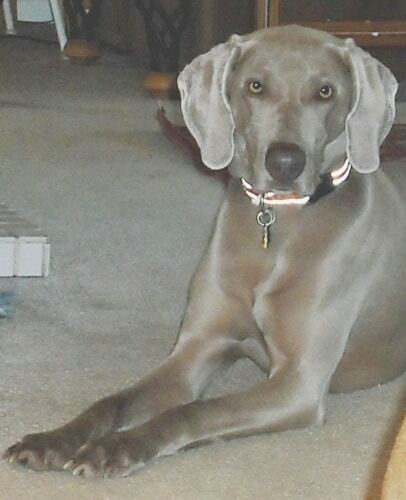 A major concern of the Weimaraner is Gastric torsion, or "bloat." This is when the stomach becomes twisted and traps the stomach contents, with gas also becoming trapped inside. This is a serious condition of dogs, and is the second killer of dogs next to cancer. Many large, deep chested dogs are at risk it in addition to Weimaraners--such as German Shepherds, Great Danes, and Dobermans--with very few people knowing about it. A condition of Bloat can kill the dog within one hour if it is left untreated. Technically it is called "Gastric Dilatation-Volvulus" ("GDV"), which is related to swallowing air even though food and fluid are present at times. Abnormal accumulations occur of air, fluid, and/or foams which are present in the stomach--this is called gastric dilatation. Even though twisting of the stomach causes a majority of the bloat diagnosis, stress also plays a large factor. When the stomach begins to swell, it can rotate 90 degrees to 360 degrees between the esophagus and the duodenum, resulting in trapped air, food, and water in the stomach area. The bloated stomach causes several things to occur in the body of the Weimaraner--low blood pressure, shock, and internal organ damage. The Weimaraner is considered to be an average shedder, due to its smooth and sleek short coat. Brushed weekly with a soft rubber bristle brush, the breed is considered an easy care for grooming. Baths should be done on a monthly basis, but can vary depending on the coat of the dog and how active it is. Depending on the location and owner, the tails are docked and dewclaws are removed. If the tail is docked, it is done at birth and 1/3 of the natural tail length is left. Ears should be cleaned weekly, especially after swimming or bathing. Dental care for the prevention of bad breath, tooth decay or gum disease is needed--dry washcloths are used or a toothbrush along with canine toothpaste. Nails on the Weimaraner are kept short and are amber or gray in color. Trimmed every two weeks, this is always difficult if the original breeder has not conditioned the puppy for toenail care. After that, it will take time to condition the older Weimaraner to the task. The best thing is to have the vet do the chore, unless a local dog groomer can bathe the dog and do the tails at the same time. The nails can be done at home if the groomer or vet has demonstrated to the owner its procedures--cutting it to short can result in excessive bleeding and pain for the dog. And on the contrary, if it is not done on a regular basis, too long of nails will become torn or cause walking difficulties for the Weimaraner or any other dog, but in particular those who are working out in the field and not on a lot of cement to wear the nails down. The Weimaraner has a medium exercise level as compared to other breeds. This is a breed that definitely does not kennel well, requiring sufficient exercise in order to prevent boredom, frustration, excessive destruction, and compulsive barking. Every breed is different, and the Weimaraner is one of its own. They require some form of strenuous exercise and lots of stimulation, as this is a very durable and active dog that requires lots of exercise. The most important thing in the caring of this breed is to include it in all family activities and give all the attention the dog craves and needs. Respect training is considered mandatory by trainers for the Weimaraner, due to its high energy and "take charge" attitude. Lots of exercise is part of this training, which should begin at a very young age. The training of the puppy begins with the mother Weimaraner. The general health, which refers to a good clean coat and clean kennel, has a lot to do with the trainability of the puppy itself. Most Weimaraners are strong and powerful, having a "slightly" stubborn streak, so becoming the alpha or top dog over the breed is essential. Early, early training is necessary, with Puppy Kindergarten the top of the list. When this little pup left home, its mom and siblings were its teachers about life. From a canine point of view, those same lessons need to be taught in a similar manner, communicating appropriate dog behavior so his puppy mind will understand. The first four to five months are the most important times in a puppy's life, and when everything will be digested fully for future lessons. Positive and negative experiences, proper socialization, and valuable reinforcement all make the puppy into a true companion of value or a negative dog who will make everything around it miserable until the dog is removed from your home to either be put down in a shelter, placed in a rescue home, or go from foster home to foster home--until someone actually takes the time to train the Weimaraner correctly. Any positive behavior should be rewarded, and then that same behavior will repeat itself by the dog. Negative behavior has the same attributes--digging in trash cans, barking, digging, chewing Sunday's best shoes up, etc. Rule number one is let the dog or puppy know who is boss. Rule number two is teach the dog or puppy in a way that can be best understand--not by the trainer but by the dog itself.